I actually paper-pieced Firecracker. You can find the pattern here. 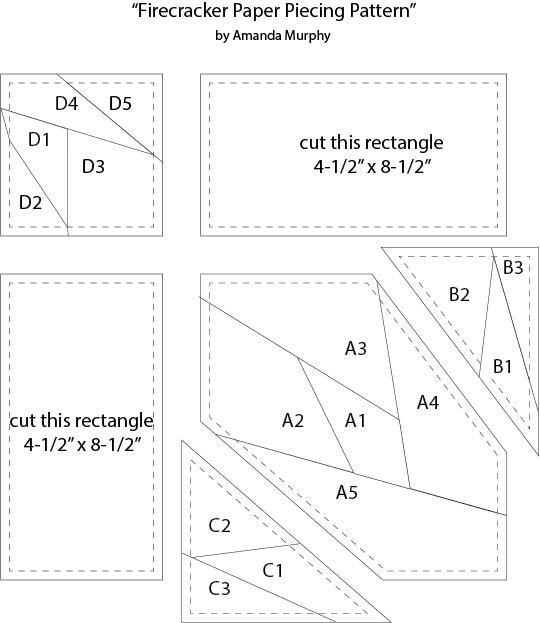 You'll need to enlarge the pattern to 200% and trace it onto paper-piecing paper. The template looks like this. The outer solid lines indicate trim lines and the dashed lines right inside them indicate seam lines in the finished block. I then pieced Sections A, B, and C together into 1 unit. And pieced this unit with Section D and the two white rectangles to form a block. I love it in red, white, and blue, but it would also be really dynamic in bright assorted colors - oranges, pinks, and greens. I hope you enjoy Firecracker! And don't forget to visit the other bloggers who are making up fun, red, white, and blue treats! You can find a full schedule of all the blogs here at Jane's Fabric and Quilts. And now for the giveaway... I'll be giving away the winner's choice of 5 patterns in my pattern line to one person who comments on this post. (I haven't updated my website to reflect the two newest yet, but Cupcake Countdown and Square Dance are also fair game.) To enter, just leave me a comment on this post telling me what your favorite color combination is... at least currently. (Mine changes almost every day.) Please consdier becomign a follower or subscribing to my Feedburner feed if you haven't already. The giveaway deadline is this Wednesday, the 11th, at midnight. I am already a follower...and right now my favorite colors are aqua and red..pretty much aqua and anything else! Love your firecracker and your patterns. Thanks! Right now I am loving Lapis Blue and Light Blue together with a little Chartreuse. I love lime green with just about anything. Right now it is Black and white and Lime green. I love, love your block and it is so clever how it all goes together to form the larger firecrackers. Can't wait to try this. Great job on your block and the way we can expand it to make a quilt!!! I love paper-piecing and this one would be really fun in a number of color combinations :*) My favorite right now is definitely aqua! Everywhere I go, I'm seeing aqua!!! Joyce and I would not be safe let loose in a fabric shop as we'd both go for the same fabrics I'm thinking! My favorite colors change every time I see a new combo. But red and white remain the first always. How clever. The little star appears like magic. Love the playfulness & that I am learning this technique. Thank you especially for the giveaway which is wonderful. I am a follower!! my favorite color combo ... hmmm, tough question ... lately, it is anything with summer brights - yellow, teal, green, purples, pinks ... Thanks! You are right my favorite changes daily. Right now it is lime green with black and gold. Oh this is wonderful. Thnaks for sharing. And thanks for the tutorial and pattern. I love paper peicing. This is a very cool block! I paper pieced a quilt once and said I would never do another one.....I have since changed my mind. Every point is sooooooo perfect with paper piecing. I think this block will be my next paper pieced project. As for my favorite color combination, I just don't know. When I see a piece of fabric that reaches out and grabs me, that becomes my current favorite color. Keeps things confusing around here! I am a happy follower of your blog - thanks for sharing your block. Love seeing the quilt mock-up. I am a paper piecing novice, but I am gaining courage from all the great designs I see! Favorite color combo - gray with anything, but especialy yellow right now. Wow,spectacular.I love paperpiecing patterns.My favortie color is green and love it with pink,red,yellow,white,blue...Thanks for the giveaway!! What a beautiful block; I love paper piecing. I think I know what one of the two top blocks will be today? Have a great day! I'm a follower and on an aqua with most any color trend right now ... even if aqua is a minor player I have to put some into the quilt. Your patterns are wonderful as is your RWB firecracker of a block. Thanks for the giveaway! Nice block! I like the quilt design it forms. One of my favourite colour combos is aqua and orange. Your block makes my heart sing. I love spikes and all. Thanks for the chance. Beautiful block Amanda and thanks for the pattern! What a fun block...would love to see it in my favorite (currently) color combo of aqua, lime green and blue. Thanks for the sweet giveaway! Woo hoo, love a giveaway snd love the paper-pieced pattern - she's a beauty! I love your paper-pieced star! Thanks to this blog hop, my favorite color combo TODAY is red and white. I love this pattern! My favorite colors today are aqua, red, grey. But you never know it changes frequently. Thanks for a wonderful giveaway. Oooh I love the block - it is so neat. Thanks for sharing. Love Firecracker! Never would have guessed it would make that lovely quilt pattern when put together. Thank you for the giveaway. have the fabric for the quilt but I need a pattern to go with it sew your giveaway is perfect. Thanks for the great giveaway. Thank you for letting us visit. That's a beautiful little block and does a really clever thing in the quilt. Very nice. My favorite colors change, also, but, currently, I love purple and turquoise. I'm a new follower and hope I win. Thank you for sharing this lovely paper pieced pattern with us. I always enjoy a block that makes added designs once they are all together. I love working with all colors - but love a paisley, so a blue paisley print with a crisp clean white . I'm loving orange and purple! It minds me of sunset. Wow! Those just pop right out there--love that block! Amanda, as usual you hit it out of the park. I LOVE that block. I recently learned paper piecing, so I will have to bookmark this. I am definitely a follower - have been since a year ago when I started finding quilting blogs and fell is LOVE with Veranda. In fact, I am using Veranda for my paper-pieced quilt from my class. Love this pattern! Thanks for sharing it. If you don't enlarge it, what size block do you end up with, do you know? Your blocks are beautiful and I love paper piecing. I love the precision of it. My favorite color combinations also change so besides the red, white and blue, my next favorite for now is black and white and lime green. I'm already a follower...really enjoy your blog. My favorite combination of colors is purple and green. Thanks for the giveaway. Oh I love that! I've saved the pattern for later - thank you. I think paper piecing scares people but it is not that difficult! Favorite color combo right now would be purple and gray combos. Favorite colors now are brights, purple, orange, red.. I really like your block. It makes such a beautiful quilt. Currently, I am liking browns and blues. Actually, I'm happy with blue plus most any other color. Well Amanda, It is Sunday and I slept in, so to me you were not late at all!! This block is just stunning! I love the white space, allows for the colors to pop! great job and thank you so much for playing. Oh my gosh, this block is absolutely beautiful! I feel like you could use it to make a gorgeous Bird of Paradise quilt block as well. Speaking of, bright colors are my favorite and I love them offset with a crisp black. I like when colors pop instead of fading into each other, but I know there's a time and a place for that too. Thank you for the great giveaway and for sharing the template of your block! I've been looking for the perfect paper piecing block to try out and I think this might be it! At the moment it's purple and pink. Amazing block! Love it. Makes such a wonderful quilt. The jewel tones are my favourites combos. Amanda, that is one awesome block. I am a follower and my favorite color combination right now is gray and yellow. Beautiful block! I never would have thought to put a small block in the opposite corner! Fabulous! I'm signed up for your feedburner! LOVE your patterns! My favorite color combo at the moment - red and white! Thanks for sharing! Paper piecing is a favorite because it is so precise. I love reds with a little white. Love Firecracker. wow that's gorgeous! it's hard to say what color combo I like right now, I usually just go for any bright colors that go well together - right now I am trying to build my stash with rainbow colors! love your patterns, in fact I purchased Portraits of my Garden last week! I've been using orange & blue several times now in my quilt projects, though green is my favorite color. Thanks for the chance to win. I'm a follower. wow! congratulations on your win! i really love your block. why? because i love fireworks and firecrackers. what a perfect block for the 4th of july. my fav colors right now are red and aqua, but i'm liking chartreuse this year, too! I already follow and I love the combination of Lime Green and dark Purple! Thanks for the great tutorial. I am a novice paper piecer, but I love this block and would love to try it. My favourite colour combo these days is black grey and red! Thanks for the chance to win. Beautiful block Amanda and very striking when put with others based on the picture of a quilt you've shown also. Thank you for the tutorial and pattern. My favorite, well, my current favorite is aqua and red together. I can't explain why but really love the combo. Thank you for the chance at your giveaway. Love your block. My favorite combination currently is navy and lime green. Great block! Love it pictured as a complete quilt. Favorite combo today only is grey and yellow. Mine too, change by the minute. Thanks so much for the giveaway! First, I have to say, this is my favorite block so far in the Hop! Very clever how it goes together to make the quilt. And I LOVE paper piecing! My fav color palette for a long time has been purple and green and all derivatives therein: lavender and lime, violet and sage, etc. Thanks again for this great block! Thanks for the chance to win. I really like pinks and blues. As you say at the moment. LOVE this block! helps that I love pp, I suppose, huh! But I've always wondered how to make the little guys float like that - now I see it's the coming together of the larger blocks that makes it happen - very cool. For some time now, I've been drawn to light teal, dark teal and purple, with a little cream thrown in. Sounds awful, looks beautiful, to me anyway! 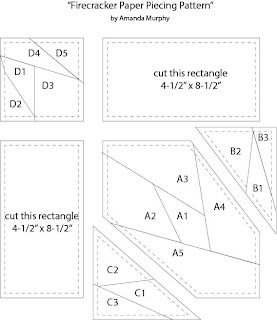 Thank you so very very much for the tutorial for the paper piecing. That is my next goal to learn how to do!! I love the crispness of the points. I am just moving from the country colors to the cottage roses shabby look and colors..Need to make a baby quilt for a baby using the shabby chic colors. I am going to take a look at your designs and patterns now. Thank you for sharing. Fantastic Block.Maybe, just maybe I can learn to paper piece. I seem to be drawn to the bright colours like Lime green, bright blues right now.Must be because it is summer and Winter seemed so long. I decided I needed to follow your blog when I saw the adorable cupcake countdown pattern. Then at the side I saw the Swiss Chocolate Pincushion and realized I had that on my list of to do projects. Your RW&B block is beautiful and even though I have not done any paper piecing yet it is also on my to do list. I usually go for purples, blues, greens and pinks but am like you and can change that anytime. There is just so much beautiful fabric out there. I love your block - thanks for sharing. My favorite color combo is blue and white - but through in red, or yellow, or green and I'm in love with those too. Fab Block! I love purple with anything! Lately I'm loving the combination of aqua, lime green and bright yellow. Love your block! I'm really loving grey and yellow right now. Thanks for the giveaway. Nice block design :) I would love to win your patterns...currently I am still in love with orange and gray. Wow! What a beatiful paper piece pattern. At the moment I like pinks and browns. Great block...thank you for the pattern! I love every color combo...really love browns and blues/aqua together. Amanda, I love your patterns and would jump for joy if I became a winner. My favorite colors right now are deep purple, green, and rose. My choise will probably change tomorrow, but now I am making a quilt with those colors and am loving it. Thanks for the chance to win. I'm so excited to see this block. I'm learning to paper piece in a class this month so I can do patterns like this! I subscribed to your e-mail as I love your patterns too. You are one talented person. I just posted but forgot my favorite color combo. I am loving teals, reds, greens right now. Almost any color combination with teal works for me! Loved how you did your block!! The paper piecing firecracker is wonderful! thanks! I love your new pattern square dance also. Thank you for the giveaway - I love lime and organe and navy right now! I like pink and lime green today. Who knows what it will be tomorrow. Love your patterns and would love to win some. Thanks for the chance. I love so many combinations that it's hard to say. At present, I'm wanting something turquoise and red. I always like red, white and blue together. Cute block! Thanks for the chance to win. My favorite at the moment would be red ,white and blue , maybe because of the blocks I just made ;-)I am already a subscriber to your blog. Thanks for the chance. I love your firecracker block. It looks so great in your quilt. I love using red and beige. But my colour choices change all the time! Thanks for the lovely giveaway. Great block...I love using colors of the holiday we are in! O red, white, and blue would be my choice, then on to Halloween oranges and blacks! I love that block!! Right now I am working on a batik quilt that is using brown and coral. My favorite colors also change daily but I seem to like everything :) Thanks for the great giveaway. The Firecracker block is awesome by itself, then when I saw it as the quilt, Oh My! Stunning. Currently my favorite color combo is red, white and blue....I think this Blog Hop has influenced me! Your firecracker block is awesome! For some reason I cannot download it to print so that means I will have to draw it myself...thinking I can. I will post it so you can see it if that happens. I follow you....great stuff over here! Love your block but I have to say I have never tried paper piecing it always looks so hard. I am a follower of your blog and right now I am loving red and aqua but like you mine changes frequently. My current favorite is aqua and red, but I also really like turquoise and brown. That will probably change next week. Thanks for the giveaway. Love your firecracker block! No big surprise to me since I love all your patterns! Love Firecracker! I also like the secondary pattern which comes from putting it together. My favourite colours hand down are yellow and blue! Makes for a fabulous quilt! Love this pattern! My favorite color combo (for now) is turquoise and brown, with red, white and black close behind. I love this block!!! Thanks so much for sharing the pattern!! I will definitely try this out!! Amanda, I am becoming a fan of paper piecing, this is a great job. Loving this blog hop, and look and am your 106 commentor. I am following. I do love "Firecracker" and the fact that it's paper-pieced. Wonderful block. Thanks for the op to win. My favorite color combination (besides red, white and blue of course) would be teal and any other color that coordinates with it! Love your block; thanks for the pattern. It's hard to top red, white, and blue - right? I find myself drawn to black and white with touches of bright colors right now. Usually pastels are my palette but I agree, I'm always changing my current favorites. I'm loving purples and greens but also have been drawn to reds and whites ever since the big quilt exhibit in all red/white. This is an beautiful piece! Love the firecracker!! I love your Cupcake Countdown pattern! My favorite color combination currently is blue and yellow. Thanks for the great giveaway! I love lots of different color combos but among my favorite are blue and green together. I love pink and gray as a pair and purple and pink and red and black ... I also love brown with other earth colors- each combo can create really lovely quilts. Mostly though I love the whole rainbow of colors in a scrappy design- I prefer dark backgrounds to light with all those exuberant colors. Thanks for participating in the blog hop. I have been a follow for awhile now. My long time standing favorite color combination is like a mix of wildflowers...shades of pinks, purples, greens, blues with a splash of yellow. I tend to have others that appeal to me for different projects, but I always come back to the flowers :-) I have become a follower, thanks! Thanks for the giveaway Amanda. I just finshed piecing garden pathe and I love how it turned out. grey, yellow & green. Thanks for the chance to win. Love your block and the quilt it makes. I haven't done much paper piecing, but I enjoyed it when I was doing it. My favorite colors, currently, are black and hot pink! Great block and love how it comes together in a quilt! I'm a follower! Thanks for your inspiration! Five of your patterns? What a delightful dilemma that would be. Thanks for the generous giveaway. Wow! Beautiful block. My current favorite color combination is red, white and blue. At the moment, I have 3 quilts in progress that use that color scheme. What a fantastic block! Loving the firework! Now can you imagine this in a watermelon and turquoise with white?! My current favorite color combo is: coneflower purple, butter yellow, pink and aqua. Can I tell you how much I LOVE to paper piece!! ahhh I LOVE fire cracker!! I'm very happily a regular follower of your wonderful designs and creations. I like anything that is bright and colorful. I prefer not too many florals, but love bold colors. Thanks for the chance to win some great paterns. Though soft yellows and garden greens generally catch my eye, I'm currently loving chocolate brown and deep pinks! Thanks for the giveaway, would love to win any of your patterns. Forgot to mention in my comment above, I'm an email follower. Thanks! I'm a happy follower, and today my colors are orange and white!! Thanks for the chance to win! Love your block - thanks for showing this. You make it look easy. My all-time, go to, favorite color combo is blue and white - so crisp and clean. Thanks for the great giveaway. I love solids right now,I can't get enough of them. Seeing all of the red white and blue is really making me happy right now. I just spied a grey and yellow combo on another blog that is really striking. I am like you, my favorite changes a lot. I am starting to work with solids which I have not really done before and I am really liking the look. I have GOT to learn how to paper piece! It scares me to death but then I see your block and I WANT to know how to do that. Great Give-Away too! I Love all your patterns but I really am dying for the cupcake pattern. Maybe if I start now I can have it done for next 4th of July. I love paper pieceing once you start it is hard to stop. I love the accuracy of foundation piecing though it is kind of a pain...did you know if a foundation is printed on muslin, it can be sewn by hand? Years ago I pieced a miniature snail's trail by hand on a car trip (I had a special rubber stamp and permanent ink to print the foundation). Back in those days I must have had too much time on my hands :) Favorite color combo today is blue, white and yellow. I am a subscriber. I have done a bit of paper piecing and the project is unfinished still. Not because I didn't like it but simply didn't pick it up until after the class. Now I feel like getting out that stack of cardboard with the pieces and getting it done. I'm not sure why I haven't come across your blog before, but I can assure you it's been added to my reader now. I'm looking forward to wandering through the archives. Currently my favorite color combinations are 30s type prints, and turkey reds and taupes. This is always changing though! I'd love to win some of your patterns----LOVE them! Gosh what a great block. I'm just learning paper piecing and I'd love to give this a try. Thanks for sharing this with us. I LOVE your firecracker block--it's so much fun! Thanks for the link to the pattern, too. Going to have to try this. Right now my favorites are the grey/yellow combos and just about anything with aqua. Thanks for sharing and for the giveaway! I love this Block! Thank you for the download and a great giveaway. My current favorite color combo is orange and grey. Love your block..firecracker and your fabric choices. Will be putting on my to do list for sure. Blue and white. Always has been, probably always will be... blue and white. Love your patterns so thanks for the chance to win! My favorite color combo today--and like you, mine changes daily--is red, blue, and yellow. So cheery. Makes me think of my mom, and brings a lot of happy memories. I'm one of your followers, Amanda. The only word I can come up with is WOW! I hope to be able to do that myself one day. My favorite color combo right now and always has been anything rainbow hued. I can't get enough of that. Oh this is a great block and a wonderfull quilt! Think at it with chirstmas colours and you have a very bright lovely star christmas quilt! I guess the possibilieties are endless! Love your patterns and my todays colour scheme is brown and pink! Ok, purple and pink is also one favo....choices! Wonderful block with so many possibilities. One of my favorite color combinations is blue/turquoise/purple. I Love yor PP RWB Firecracker Block! Thanks for the Design! I will surely make this because I LOVE Paper Piecing! I love your Patterns! Thanks for this Great Giveaway! I'm with you, Amanda ... my fav colors seem to change every day, or week, or month at least!! Right NOW my fav is turqoise and yellow-golds, but blue and white has always been a constant fav of mine. Thanks for the giveaway! 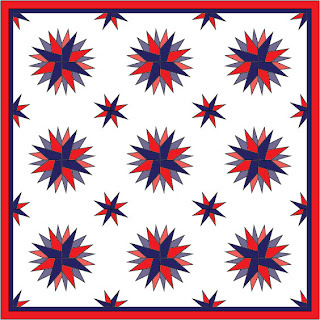 I LOVE the Firecracker quilt possibility! I'd love to see that finished up although I'm sure you're swamped like the rest of us. My favorite color combo right now is a black/white print with turquoise blue. I don't know why but it just is. Love it! I've never tried paper piecing. I love red/aqua/white. Firecracker looks like a fun block. I do get a little crazy when it comes to paper piecing. Everyone arounds me complains, but I love it! My current favorite color combos are navy and cream. Thanks! I like red and aqua! Oh I am in love with this quilt! Your tutorial was great! that is an awesome design! Beautiful... just bea-u-ti-ful!!! Wow, great design. My favorite colors are red and navy! I love your blog. The patterns and colors are fantastic. These are so pretty. I love this blog. The patterns are fantastic. I love the colors and designs.